Stephens, J. (2011). 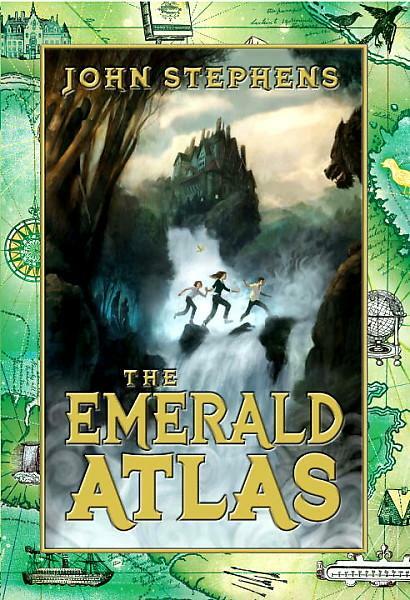 The emerald atlas. New York, NY: Alfred A. Knopf. Witches, wizards, dwarves, and time traveling orphans, oh my! Siblings Katherine, Emma, and Michael are dropped off at an orphanage when they were very little by their parents. They are transferred from the Edgar Allan Poe Home for Hopeless and Incorrigible Orphans to a mysterious orphanage in the magical town of Cambridge Falls where these children are the only three in existence. It is run by Dr. Stanislaus Pym, a magician, yet they don’t know that at the time. While exploring the house, they discover a study where they find a green book, yet all of the pages are blank. When Michael puts a picture into the book, they surprisingly travel 15 years into the past to the time and place of the picture. With the magical time traveling book (one of the three Books of Beginning), their Polaroid camera, and their own wits, the siblings are able to fix the unfortunate history of Cambridge Falls. As they are transported back and forth through time they encounter a wicked Countess that needs a special child so she can rule the world, The Dead City, dwarves, and The Screechers who want to kill them. They also befriend Dr. Pym when he was younger (he knows a lot about siblings past), children of the town from the past, and Gabriel. Overtime they realize that they are part of a bigger quest against evil and have a larger part to play as the story does not end with The Emerald Atlas. Each character is unique, strong, well defined, and each has distinctively different roles to the story. Kate, Michael, and Emma’s strengths are their devotion to each other, their belief in their parents’ love for them, and their desire to do the right thing. Kate is protective and mothering as the oldest sibling. Michael is a bookworm and is obsessed with dwarves, and Emma, the youngest sibling is feisty and quick to prove she’s older than she actually is. All three are unusually intelligent and insightful for their ages. The Countess finds pleasure in hurting others, even children. Dr. Pym, the Countess’ nemesis is far more powerful than he leads on, and Gabriel is the one villager willing to help Kate, Michael, and Emma, and willing to stand up against the Countess when no other adults will. The Emerald Atlas is an exciting fantasy with spine-chilling villains, surprising plot twists, magic, humor, and likeable, fun characters. This is a story of the strength of family bond, friendships that knows no barriers of age or race, and debates the notion of one’s destiny (common in fantasy) is an individual’s choice. Fans of the Harry Potter series by J.K. Rowling, A Series of Unfortunate Events by Lemony Snicket, and Reckless by Cornelia Funke will love John Stephens Books of Beginning, The Emerald Atlas and the sequel, The Fire Chronicle.